For years educators have asked me to help guide them through the MMR course series, according to the grade levels of the students they work with. Now that the MMR professional development course series has grown to 11 seminars, I would like to introduce the Recommended Course Sequence Guide to help you navigate the course schedules and maximize your learning and integration of the course content. Since it would be overwhelming to require participants to follow the intended order or to schedule courses exclusively by the intended order, I have created several recommended course sequences that may facilitate participants getting what they most need more quickly and more directly. 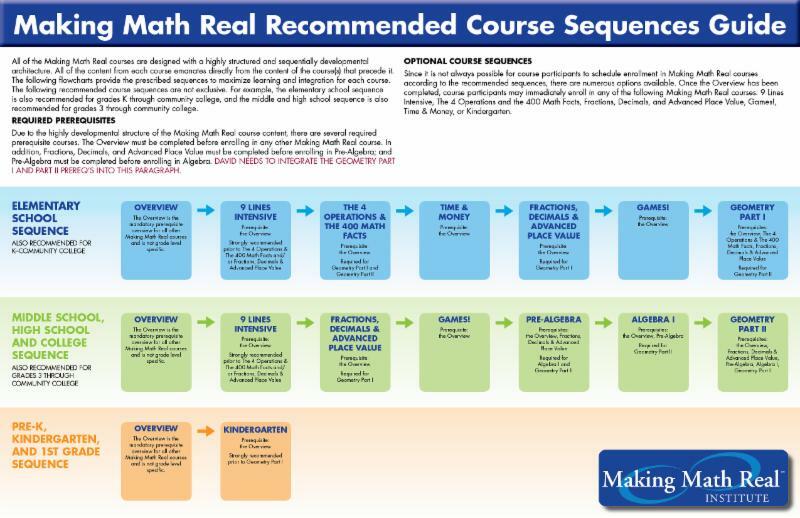 The Making Math Real Recommended Course Sequences Guide provides the prescribed sequences to maximize learning and integration for each course. Since it is not always possible for course participants to schedule enrollment in Making Math Real courses according to these recommended sequences, there are numerous options available, once the Overview has been completed. If you have any questions about the courses and sequences that interest you, please do not hesitate to contact the Institute at info@makingmathreal.org. We look forward to hearing from you!